Korean cosmetics from the company Fuji is a source of beauty for the skin and fun! Consistent, high-quality tools, attention to detail, are practical, bright and compact packaging that allows you to try new products without compromising the budget. Cream with snail filtrate and ginseng, the formula of which is born of a harmonious blend of the strongest natural ingredients. Snail slime forms on the skin surface protective film that prevents the evaporation of moisture and exposure to aggressive factors, while not disrupting cell respiration and metabolism. 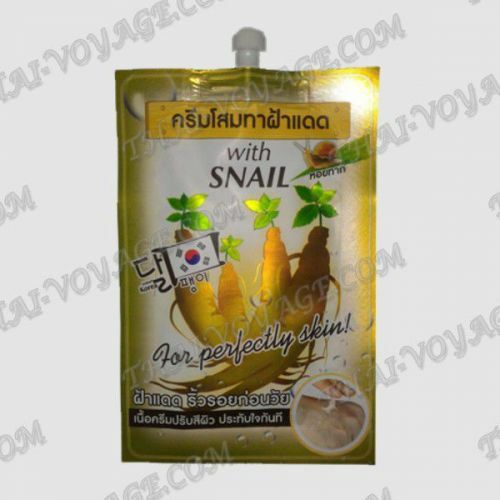 Regular use of snail cosmetics helps to get rid of wrinkles, pigmentation, acne, increase firmness and elasticity, gradually remove scars. Ginseng contains a number of vitamins, amino acids and antioxidants, improves blood circulation, accelerates cell division and renewal of the epidermis, protects against free radicals – the main causes of aging, fights acne and oily Shine. Alpha-arbutin gently lightens pigmentation and aligning the overall tone of the skin. Snail cream has a light texture, absorbs quickly, leaving no greasy residue or sticky feeling. Try this wonderful tool to share the love of many girls around the World! A great cream to create the perfect skin! A light cream with beneficial ingredients fill the skin beauty and healthy glow! Application: apply a small amount of cream to clean, dry skin.